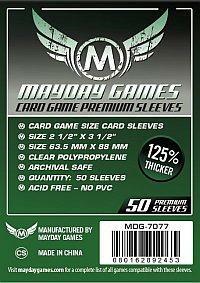 50 Premium Card Game Sleeves (63.5mm by 88mm). Sleeves Splendor cards perfectly. Top quality cards, great feel and look to them, don't bother saving a few pence on cheaper sleeves. Great fit for Splendor cards, my only gripe is that the sleeves are quite glossy so hard to hold the deck without them slipping everywhere!